As spring turns to summer, so the busiest time of the year kicks off for Peterborough based production and rental company Pearce Hire. Alongside working for a number of new clients and some high profile one-off’s that have taken place over recent weeks, Pearce Hire is in the midst of producing a series of events for some long standing and loyal customers. 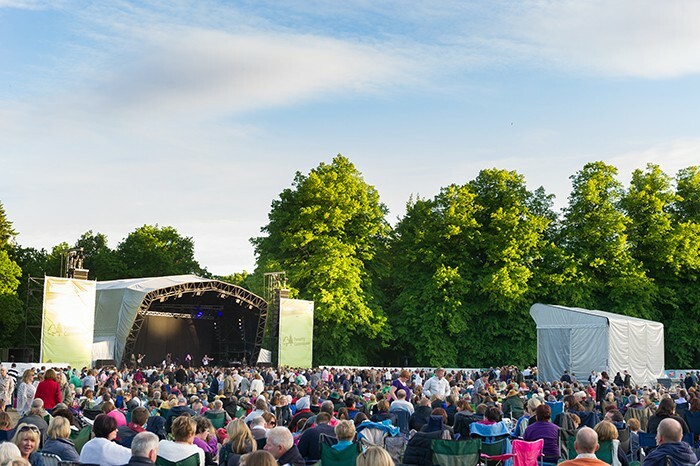 Earlier in the year, Shaun Pearce and his team were involved in an extensive tender process to secure long-term contracts with a number of key clients including the Forestry Commission, the Cambridge Folk Festival, and Warners Group Publications Plc. Pearce Hire’s connections with these organisations stretch back many years and the tender process has led to contract renewals all round. And it is the resulting events which are in part responsible for the busy weeks ahead. Forest Live is a series of concerts run at seven different Forestry Commission sites around the country over nine weekends in June and July. The events take place with a backdrop of beautiful woodland and forests, and the Pearce Hire team help deliver a temporary infrastructure whilst preserving the natural environments they are working in. Pearce Hire’s project manager John Huson explains: "Our involvement extends back 12 years when Forest Live was a far smaller proposition than it is now, and has increased over the years to a point where we supply all power distribution and site lighting to all seven sites, as well as the lighting rigs. "We are required to meet the demands of several different artists across the various events, who this year include Paloma Faith, Blondie, The Script, Jessie J and Paul Weller to name a few. To achieve this we draw on our extensive inventory including Martin, Robe and i-Pix lighting fixtures, Chamsys control, and our own bespoke power distribution system. One of the most challenging parts of the project is running two identical systems in different locations for the first three weekends, but our investment over the years has meant we supply both rigs in their entirety whilst also delivering production needs for our other customers at the same time." One of the growing challenges since Pearce Hire started working for the Forestry Commission is the issue of event sustainability. But they rate highly in these credentials, as Huson explains ‘ We have made a number of changes to demonstrate sustainable practice, and over the past five years, mainly through the introduction of LED fixtures, we have reduced the total power consumption of the Forest Live lighting rig by over 45%. Power consumption and carbon emissions have also been positively impacted by the use of lower wattage discharge fixtures across all the site lighting and also ensuring that site lighting fixtures are switched off during the daytime." David Barrow from DB Event Services is part of the Forestry Commission’s Forest Live National Team handling programming, production and licensing for the series of concerts. He has had a long working relationship with Pearce Hire stretching back 23 years and is delighted that Pearce Hire’s bid at the beginning of the year proved successful. "A major part of the success of the Forest Live programme is that our key production suppliers have remained the same and Pearce Hire’s team have been a crucial part of this. They are spot on with their services and equipment and their delivery is second to none. The tour is a logistical ‘beast’ as we are running back-to-back sites at times. The production is a well-oiled machine as it moves across the UK to the next sites so the set-up is 100% the same at each site. The Forest Live shows have certainly grown from strength to strength since their inception in 2001 and Pearce Hire deserve credit for being a part of that success." Rachael Miller, events manager for the Forestry Commission couldn’t agree more and is clear on why they have renewed the contract with Pearce Hire for the next five years, commenting: "‘I’m very happy that Pearce Hire have successfully tendered to supply our events until 2017. They have extensive experience on this type of outdoor event, and combined with their huge amount of stock this means they are able to deliver a complete service, as well as respond to inevitable last minute changes. Their staff are valued members of our onsite teams and everyone works together to deliver the events." Forest Live kicked off three weeks ago with Blondie, Paloma Faith and James performing at Thetford Forest and Paloma Faith and Blondie performing at Sherwood Pines Forest Park. Other sites include Bedgebury National Pinetum, Dalby Forest, Cannock Chase Forest, Delamere Forest and Westonbirt Arboretum.